Posted in Congress, Democrats, Donald Trump. Tags: Congress, Democrats, Donald Trump, Joe Scarborough. RSS feed for comments on this post.. TrackBack URL. Would you be kind enough to point me to the section in the proposed bill requiring the number of psychiatrists to involved in the procedure to be at? Unbelievable that some thing like this should be suggested. President trump is of sound mind and doing well. I question whether Trump is of sound mind, and he is certainly not doing well in carrying out his duties as president. Regardless, this would require bipartisan support and only work should maters worsen significantly and it become clear to a majority, including many of those who voted for him, that it is urgent to remove him from office. Trump is sane. But he is nyekultorniya. He is singularly unqualified for the job by experience, but the only legal requirements to be president is citizenship and age. Trump qualifies on those which are the only legal requirement. There is no Constitutional requirement that the President elect have prior experience. The Democrats want to remove our legally elected President because he will not dance to their tune. Yes, they would. 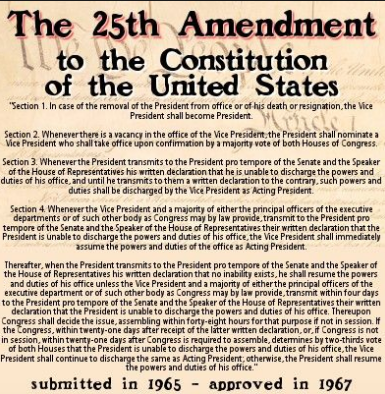 However, this week (when the comment was posted as opposed to the original post) it is Republicans in the Trump administration who have brought up the 25th Amendment.